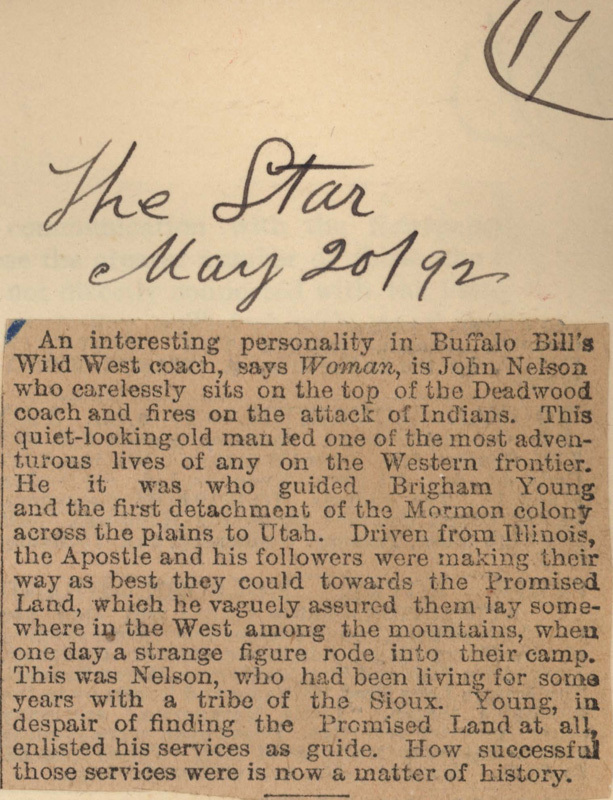 An interesting personality in Buffalo Bill's Wild West coach, says Woman, is John Nelson who carelessly sits on the top of the Deadwood coach and fires on the attack of Indians. This quiet-looking old man led one of the most adventurous lives of any on the Western frontier. He it was who guided Brigham Young and the first detachment of the Mormon colony across the plains to Utah. 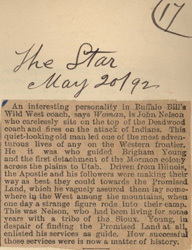 Driven from Illinois, the Apostle and his followers were making their way as best they could towards the Promised Land, which he vaguely assured them lay somewhere in the West among the mountains, when one day a strange figure rode into their camp. This was Nelson, who had been living for some years with a tribe of the Sioux. Young, in despair of finding the Promised Land at all, enlisted his services as guide. How successful those services were is now a matter of history.